There was little on for Pedro Obiang. Just as there had been little on for West Ham United for 70 minutes, which had not been a great surprise given the emphasis David Moyes has placed on defensive solidity. Obiang had three Tottenham players in his vicinity but none of them moved to close him down and so he edged forward a little and decided to have a shot. What happened next sent the travelling supporters into raptures and represented the latest step in the right direction for the club’s relegation battle. From fully 25 yards, Obiang aimed a shot at Hugo Lloris’s near, top corner and the goalkeeper could only feel its fizz as it beat him. Perhaps Lloris was surprised. It was not only West Ham’s first shot of the evening but their first opening of any description. Moyes had instructed Obiang to sit in front of the back five, alongside Mark Noble, and not to stray too far. “I don’t know what Pedro was doing there,” Noble said with a smile. When the ball hit the net, the smash and grab was on. Tottenham were staring at a setback in their attempt to get closer to the top four. They needed a riposte. Son Heung-min provided it. Whatever Obiang could do, he clearly felt he could match. It was a similar kind of situation. Son had no clear options when he collected possession and so he tried his luck. He cut across the ball with his right boot and the swerve and power were too much for Adrián. The long-range classics brought a drab encounter to life. Rather abruptly, a London derby broke out and West Ham, against the run of play, might even have nicked it. André Ayew, who Moyes felt had made a difference after his introduction as a substitute, wriggled through and Lloris needed to block at close quarters. Defeat would have been awfully hard on Tottenham, who dominated the game and had 31 attempts on goal to West Ham’s three. They hogged possession and for long periods, it seemed as though they were camped inside the West Ham half. But it was not a night when Harry Kane or any of their attacking talents were able to cut loose. West Ham had already won the most important game of their week – the home fixture against relegation rivals West Bromwich Albion on Tuesday – and the pre-match theory had been that this was something of a free hit, if a must-not-lose derby against hated rivals can be so considered. Tottenham’s previous match had been their 2-0 win away to Swansea. A feature of Moyes’s tenure has been his cagey approach against so-called big six teams and it had worked in the victory over Chelsea and the 0-0 draw against Arsenal. West Ham had even looked good in the loss at Manchester City. As against those teams, they were under no pressure to come out. They did not. West Ham made it into the Tottenham penalty area only once during the first half, through Javier Hernández and, when the striker cut the ball back, there was nobody there. But Moyes has made no apologies for his approach in this type of game and with the unbalanced squad that he has inherited, he need not. Kane was back in the Tottenham starting XI, after only playing the last 22 minutes against Swansea, and he had five flickers in or around the West Ham box in the first half without truly threatening. He worked Adrián from 20 yards and when Serge Aurier headed Jan Vertonghen’s long ball inside, Kane could not meet it. 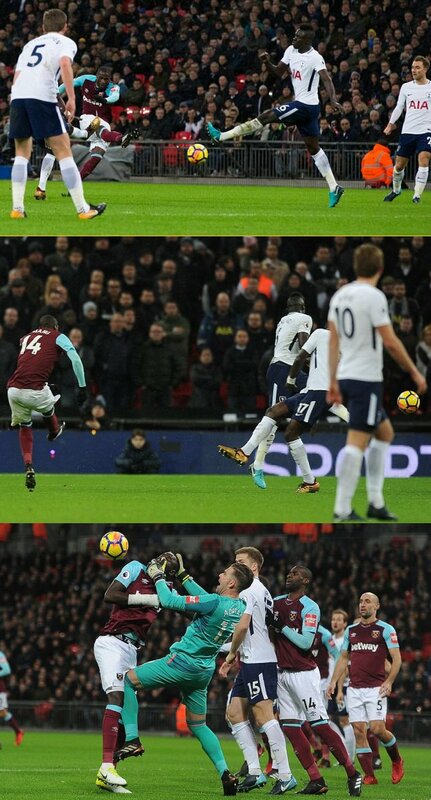 Davinson Sánchez had seen a shot blocked in the early running, after Adrián had dropped a corner, but West Ham could be pleased at their efforts to keep Tottenham at arm’s length in the first half. Most of the home team’s attempts were from distance and there were a couple of ragged ones from Eric Dier and Aurier, which seemed like signs of frustration. On the other hand, Christian Eriksen fizzed a low one past the post and fully extended Adrián with a deflected shot on 45 minutes, after Dele Alli had teed him up with a nutmeg on Obiang. Tottenham continued to press in the second half; West Ham continued to throw bodies in their way. Eriksen had a volley blocked by Winston Reid and another shot saved by Adrián while Kane turned Reid only for Pablo Zabaleta to step across to make the saving tackle. When the ball looped up, Adrián cleaned out Alli but Mauricio Pochettino did not complain about the non-award of a penalty.